The Terms and Conditions apply to all contracts for the rental use of rooms for accommodation and all additional services provided to the customer. They can be replaced by terms and conditions agreed upon on a case-by-case basis. 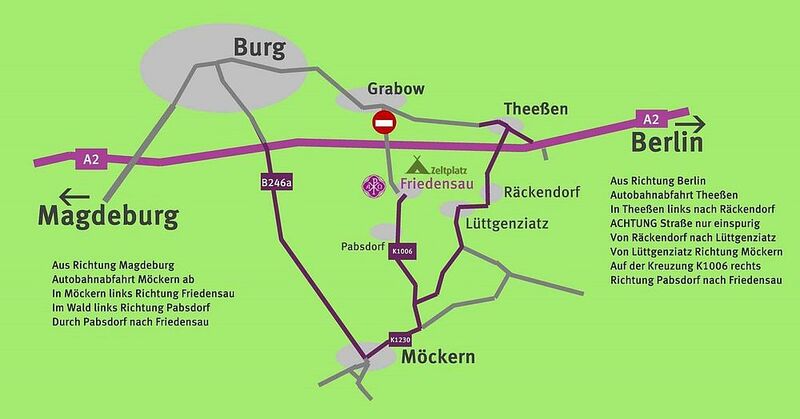 The Terms and Conditions are accessible for all customers and guests either at Friedensau Guesthouse or on its website. Any subletting and reletting of the rented rooms as well as using the rented rooms for any other purpose than accommodation require the prior written consent of Friedensau Guesthouse. The responsible body of Friedensau Guesthouse is Anstalten der Freikirche der Siebenten-Tags-Adventisten Friedensau e.V., an institution of the Seventh-day Adventist Church in Europe. At Friedensau Guesthouse, smoking and drinking alcohol is forbidden. This applies to all rooms of Friedensau Guesthouse. Friedensau Guesthouse does not welcome pets of any kind. The Terms and Conditions apply to all buildings, in other words, to the guesthouse and all apartment houses. The accommodation contract is considered to be concluded if the availability reservation of a room has been made by a guest either by telephone, e-mail, fax or online and has been confirmed by Friedensau Guesthouse. Likewise, the confirmation of Friedensau Guesthouse can be made by telephone, e-mail, fax or, upon request, by post. The accommodation contract can also be concluded by conclusive behavior, especially, if a room is booked and made available, although there was no time for an explicit confirmation. The contracting parties are Friedensau Guesthouse, represented by Mr Udo Brünner, and the guest. If the person making the reservation acts in behalf of guests registered by him, he takes responsibility for the hereby justified liabilities and all obligations arising from the accommodation contract. Friedensau Guesthouse is obliged to make available the rooms booked by the guest, or rather customer, and perform the agreed services. The outstanding invoice amount is to be paid either on site in cash, per credit card or EC card or at the end of the stay on account. Friedensau Guesthouse does not accept checks of any kind. In the case of early departure, the entire amount must be paid. Friedensau Guesthouse reserves the right to claim further loss, especially, the loss of further letting. Invoices of Friedensau Guesthouse are, without any exception, payable without any deductions within 14 days after the invoice date. In the case of delay in payment, Friedensau Guesthouse has the right to charge interest at a rate of 5 % above the respective key interest rate of the European Central Bank. If the period between the conclusion of the contract and the fulfillment of the contract exceeds 4 months and the price generally charged for such services by Friedensau Guesthouse increases, this may lead to an appropriate increase in the contractually agreed price, but not of more than 10 %. The agreed prices include the respective statutory value added tax. Changes in value added tax are to the credit or debit of the guest. On conclusion of the contract or thereafter, Friedensau Guesthouse has the right to call for appropriate advanced payment or rental deposit. The amount of the advance payment and the payment dates are agreed in writing. The cancellation must always be made in writing (by e-mail, letter, fax). Cancellations made more than 12 weeks before arrival are free of charge. If the cancellation is made at a later point in time, the following cancellation fees are raised: Cancellations within:12 to 8 weeks before arrival: 15 %, 8 to 4 weeks before arrival: 30 %, 4 to 2 weeks before arrival: 60 %, 2 to 1 week(s) before arrival: 80 %, 6 to 4 days before arrival: 85 %, 3 to 0 days or rather non-appearance before/on arrival: 90 %. For groups, the cancellation of up to 10 % of the beds reserved is free of charge within 4 days before arrival. Later cancellations will be invoiced with 90 %. Cancellation of more than 10 % of the beds will be invoiced according to the above-mentioned differentiation. The cancellation conditions will be reduced by the amount gained by Friedensau Guesthouse from the further letting of the rooms canceled. The customer is free to prove that no loss has occurred, or that the resulting loss for Friedensau Guesthouse is lower than the flat rate demanded. Provided that Friedensau Guesthouse and the guest have agreed on a date for the cancellation of the contract in writing, the guest may cancel the contract until then, without reasoning any payment or compensation claims of Friedensau Guesthouse. The customer’s right of cancellation expires if he does not make use of his right of cancellation in writing to Friedensau Guesthouse by the agreed date. Provided that there is a written agreement on the customer’s right of cancellation within a certain period of time, Friedensau Guesthouse itself has the right to cancel the contract, even if the customer has not explicitly waived the right of cancellation. If an agreed advanced payment has not been made by the agreed date, Friedensau Guesthouse also has the right to cancel the contract. - Friedensau Guesthouse has justified reason for assuming that the customer’s use of the accommodation services may put at risk the smooth operation, safety or public image of Friedensau Guesthouse. In the case of justified cancellation by Friedensau Guesthouse, the customer cannot claim compensation. Friedensau Guesthouse must immediately inform the customer about exercising the right of cancellation on the communication path previously used with the customer. Unless otherwise agreed, the customer does not have any right to the availability of certain rooms. Check-in: The rooms booked are made available for the customer from 14:00 on the agreed day of arrival. The customer has no right to earlier availability of the room. Arrivals are possible between 14:00 and 20:00, every day of the week. Outside these times and without agreement, the proper reception of the guests cannot be guaranteed. Therefore, guests must necessarily give information about late arrivals to Friedensau Guesthouse. Check-out: On the agreed day of departure, the rooms must be vacated and made available to Friedensau Guesthouse by 10:00 at the latest. The guest is liable to Friedensau Guesthouse for the damage/loss caused by him or his guests. Friedensau Guesthouse is not liable to the guest, or rather the contracting party, for not performing services in the case of force majeure. In that case, Friedensau Guesthouse strives for a different procurement of equivalent services. It is the guest's responsibility to insure all objects brought into the guesthouse's buildings against theft or damage or destruction. The liability of Friedensau Guesthouse is excluded in case of loss, theft, damage or destruction of the guest’s objects. Should disturbances or deficiencies occur in the services of Friedensau Guesthouse, Friedensau Guesthouse will endeavor to remedy such upon knowledge thereof or upon objection without undue delay by the customer. The guest, for his part, is obliged to contribute to a reasonable degree to remedy the disturbances and minimize possible damage. The liability claims expire, unless the customer, immediately after gaining knowledge of loss, destruction or damage, notifies that to Friedensau Guesthouse, or rather Mr Udo Brünner. The place of performance and payment is Friedensau. The place of jurisdiction is Magdeburg. Should individual provisions of these Terms and Conditions for the accommodation contract and accommodation in Friedensau Guesthouse be or become invalid or void, this shall not affect the validity of the remaining provisions. In addition, the statutory provisions apply.